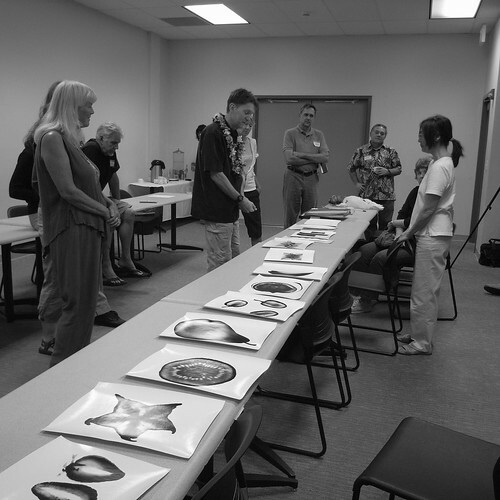 Friday was the judging for the Hawai`i Photo Expo and the results will be announced at the opening reception next Friday. I’ll be looking forward to the opening and a chance to see some nice photography, including two of my prints. The framing looked great and regardless of whatever the outcome of the judging will be I’m just delighted to have 2 pieces in the show. I’ll have a report on that next weekend. Meanwhile, yesterday was the traditional workshop that we have with the juror. Our juror this year was Brian Taylor, and his workshop was primarily a series of portfolio reviews, with a little presentation about himself and his photography at the beginning. The day was delightful and insightful; I almost always enjoy these kinds of workshops. My folio went over pretty well both with Daniel and the group, and I got some helpful feedback on it. Daniel is an accomplished photographer and I think the group was universally impressed with his work. He was also extremely gracious and professional (perhaps a bit too gracious at times, but then again, he’s probably used to running into people at his workshops that can’t take any constructive criticism and get all prickly). Just to have a day to talk photography with some like-minded folks is a really pleasant way to spend a Saturday. I would encourage anyone with a serious interest in photography to take a workshop sometime. I used to think that it would be a waste of my time and money, but I’ve taken several workshops now and I have changed my opinion on that 180 degrees. Really worthwhile.